I really enjoyed participating in my first Finish Along in 2015 (Check out all the details for last year here). I didn't get a as much done as I would have liked last year, but it was a nice way to track my progress. I'll be happy to look back at my blog posts in years future. I can't wait to start 2016! Although technically I missed the cut off to link up my 2015Q4 List, I still made one and completed a finish on my list! I haven't been able to post the quilt I finished bc it's still hasn't been gifted. Since I wasn't able to add to the link up, it didn't really matter. But keep your eye out for that post: coming soon! I thought about this project a lot, but I suppose that doesn't really count. Some work got done on this and it'll make the new list. Work got done on this and it'll be in the new list, too! 6) Finish piecing front, piece back, baste, quilt, bind Xmas Medallion Quilt. In my goals for this year, I want to get a quilting finish done each month. This won't stop me from making my 2016Q1 list longer than 3 items! 1) Finish piecing, baste, quilt, bind and label OC/GC Baby Quilt. I'm gonna try and list these in order in which they need to get done, and this is the first. I have some ideas about how I want to quilt this one, so I can't wait to get started. 3) Finish quilting, bind, and label Quilt for Grandma Doris. 4) Quilt, bind, and label Geometric Gift Quilt. This might be my biggest quilt to date and I'm eager to finish it. 5) Finish quilting, bind, and label Original Mini. This one goes way back! Setting deadlines is another one of my goals this year, so I feel that this is a great list to help me achieve that. I'm so pleased to be linking up with Debbie at A Quilter's Table this year for the 2016 Finish Along. This year's FAL is spread over several blogs, but here's where you can find all the details to join. 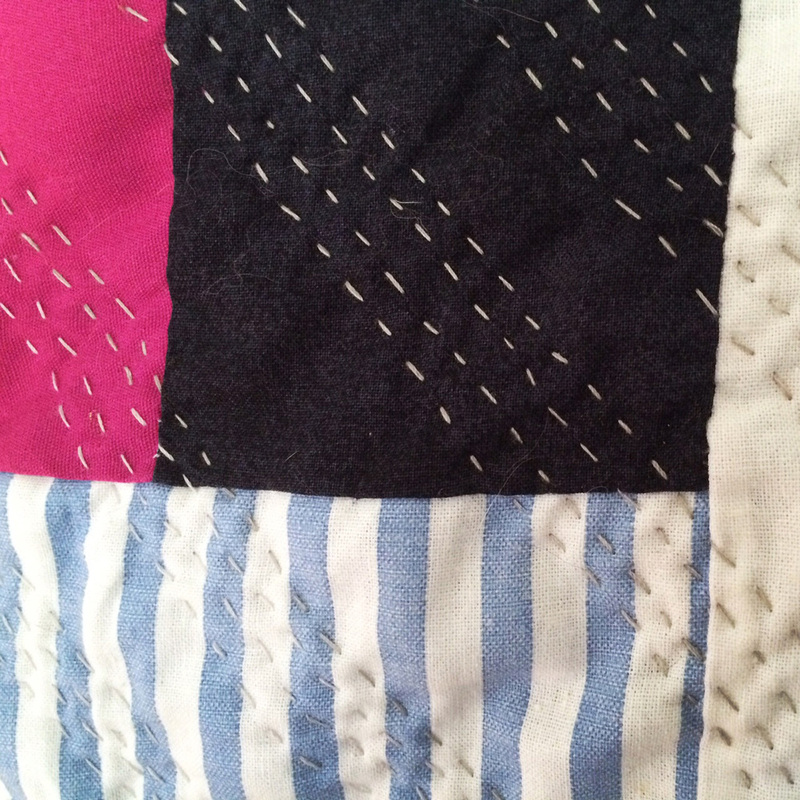 I hope some of my readers will join up and share their progress with Mad Cat Quilts! Out of 15 unique quilts that made it to my 2015 lists I finished 5. One third of my year's goal is a pretty good start, I think!! Commissioned Baby Quilt #1 - Post to follow. Back in September, we headed out to Alabama for my brother-in-law's wedding. We also took a few days to go to New Orleans, LA. I'd been to NOLA once before and stayed in the Frenchman Hotel. I enjoyed it so much, we stayed there again. It's centrally located on Frenchman Street and it's got a lot of New Orleans charm (including wonky doors, buggy bathrooms, music in the air, and the sweetest little court yard pool!). We mostly walked and took trolleys around the city and visited as many areas as we could in the short time we had. We went to Bourbon Street, of course, walked around the Merigny, the French Quarter, and East Carrolltown (where we had an amazing meal at Ba Chi Canteen). NOLA is a pretty great walking city, as long as you're accustomed to walking. The trolleys are easy to get the hang of. But remember, you buy your ticket on the trolley, there are no outside ticket machines. Being from NYC, this confused us at first. We spent a large portion of one day at City Park. The museum was closed that day, but we were able to explore the NOMA Sculpture Garden. More on that in this post. The Park is a little far out from our hotel for walking, but the bumpy trolley ride is perfect for seeing the city. The locals also take the trolleys so you'll see kids and commuters, as well as tourists. The park is vast and we only scratched the surface. But we had a great time following ducks and taking in a bit of Southern nature. I've never seen such a variety of moss! We found a great spot in City Park for a snack. Morning Call had great beignets, a staple of any New Orleans visit. Of course we also made a few stops at Cafe Du Monde!! Three trips for beignets in two days seem totally normal to me. Finding vegetarian options in popular/traditional restaurants was a bit of a challenge at times. But there are so many great food options in NOLA, all sorts of varieties and ethnicities. There's something for everyone, you just need to search it out. My first visit to the city was completely magical, and I wondered how this trip would compare. Walking around NOLA was a lot like I remembered. So bright and colorful, quiet and still in the hazy heat, but vibrant and living. I could easily just walk around for hours. There seemed to be more people around this time, but that might be time of year. I have to say that I was surprised to see quite a few more people who seemed to be living on the streets, or in need. I think NOLA has a reputation as a hedonistic paradise, full of debauchery, but that the influx of down and out types might be a dark consequence. Even we visited a casino, but just for a walk though. We went to the Audubon Aquarium of the Americas. Look for a post all about that soon. On our drive from Alabama, we drove over the Lake Pontchartain Causeway. We were excited to see it since it's the longest bridge over water in the world!! Unfortunately it was pitch black. Only one of the reasons we will definitely be going back to visit New Orleans again. Not being one for a debaucherous lifestyle, I do absolutely believe one should indulge in life. For me, New Orleans has so much possibility for wonderful indulging, without the need to go totally crazy. Its strangely satisfying to drink on the street, but I rarely do it. I love to eat the town's powdered sugar staple, but find a great healthy option for dinner or lunch. For me, the eerie calmness that prevails in the residential areas is more enticing than the party town atmosphere on Bourbon St. New Orleans holds a mysterious balance for me, and I'm always eager to return. 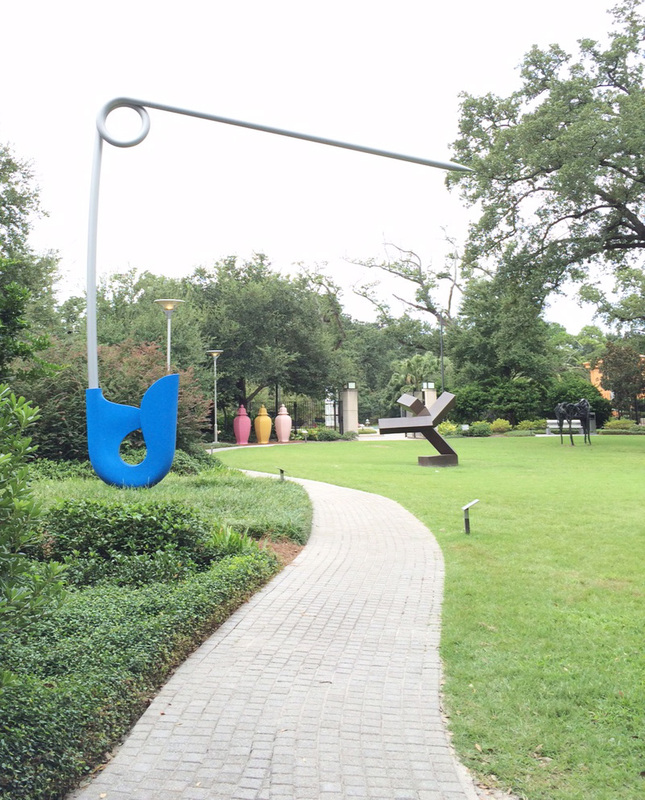 While we were in New Orleans we went to the New Orleans Museum of Art Sculpture Garden. The museum itself was closed as it was a Monday. But the Garden is open 7 days a week. There were quite a few nice pieces, including a Magritte right was we walked in! There were several other notable sculptures, as well, all nestled among winding pathways. Water features prominently in the sculpture garden, along with the large Spanish moss covered trees, this makes the garden cool and breezy to walk thru. We encountered many lizards darting on the paths but try as we might, we couldn't catch any. We also crossed paths with a surprisingly aggressive duck. We had a puzzle of trying to get him to let us get around him as we wound our way through the garden. We soon realized that his aggressive nature was merely a food seeking ploy and we followed him on his begging route until he landed us at a perfect spot for a cool break. Over the weekend, we attended my Brother-in-Law's wedding in Andalusia, Alabama. Having never been to Alabama, I wasn't sure what to expect. And honestly, spending only 2 days there did not give me the full picture, I don't think. We flew into New Orleans and drove the 4 hours to Andalusia with just enough time to check into the hotel, get dressed and head back out to the wedding. We stayed in the Best Western Andalusia where my in-laws also stayed. We chose this hotel bc it was the only one in the area with a pool. Very important, of course!! The hotel is also very centrally located in the small city. It's in a busy, commercial area, but only minutes from the town center and square. The wedding was held at the Sweet Gum Bottom Bed and Breakfast, which was about a 20 minute drive from the hotel. It was a very quaint and lovely spot! In addition to the B&B, it also housed a small, simple chapel, and a small reception hall. One stop shopping for your wedding local in Andalusia. The wedding ceremony was lovely and brief with the bridal party wearing white and cream, and the groomsmen in light grey. A dear friend of the couple officiated and the groom's brother and father stood by his side. White flowers and babies breath decorated the hall. The reception was held next door and catered with traditional Southern cooking; black eyed peas, bitter greens, and rutabagas (all drowned deliciously in butter and bacon!) as well as fall off the fork, melt in your mouth, stuffed pork chops and beef brisket both with their own gravy. Mashed potatoes, a veggie mix and fresh rolls were used to sop up every bite. There was enough sweet tea to satisfy any trip to the South. The wedding cake was simple and super tasty and apparently procured from a cake baker who works out of a gas station. Alabama seems to love combining businesses where ever possible. We passed a shop proclaiming "New Fashions" on one side and "Used Autos" on the other. 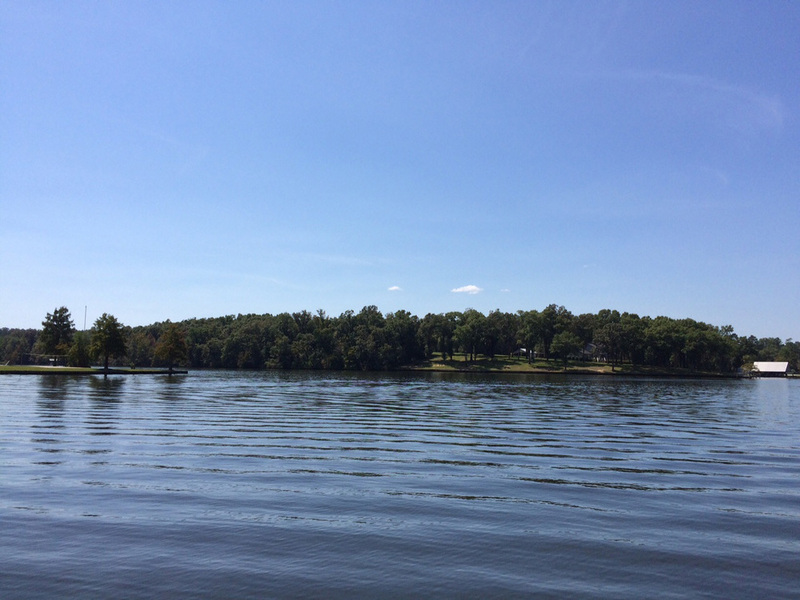 After the reception, the party moved to the couple's home on Gantt Lake, in Gantt, Alabama. Although some partied into the night, we headed home early. In the morning, after a quick dip at the hotel pool, we checked out and went to the town square. A tiny old town, Andalusia boasts one of the oldest existing Dairy Queens. The town must once have been a really lovely place to live, the remnants of business, commerce and industry can still be seen. But everything there now is only the leftover hollow shell. Very few small, unique businesses now exist in town centers but chains, discount shops, and big corporations abound by the highways. Alabama was very sad in this respect, depressing. We drove through many such towns, which once must have been thriving communities but we had long since missed them and were left only with their ghosts. Andalusia was at least still trying, painting murals and advertising attractions such as the gas station where Hank Williams got married (falsely married, however). After our brief tour, we headed back to the lake. More swimming! Like most places I have visited in America, I was interested to see how Alabamian's live, and I would love to see more. Driving thru only gave me a small glimpse of what life there must be like. I was very happy to be in a place I've never been (albeit a downtrodden, depressing one), and see things Ive never seen before (an armadillo! Albeit a dead one). What struck me most about AL, was the changes and diversity in landscape. From the piney stretches, to wide open fields filled with hay rolls or cotton (beautiful!!! ), to the cheesy chain lined highways, and near abandoned brick towns, to the shimmering lake and waterways, I was never sure what I was going to see next. And Alabama is full of butterflies! Bc we now have a brother and sister who live there, hopefully we will be back to do more exploring of life in Alabama. Even though it was a depressed and depressing place, one that time seems to have either forgotten or sped over, Alabama seemed to be brimming with potential. Andalusia seemed to me to be just waiting for the next thing to restart it's dying culture and community. I'm never gonna finish this, I've decided and am taking it off my lists for the year. 2. Finish piecing, baste, quilt, bind, and label Quilt for Grandma Doris. I did make quilt a bit of progress with this one, so it will continue to my Q3 list. 3. Quilt, bind, and label the Scrappy Heart Quilt. Done! The only project I finished. Find the blog entry here. 4. Finish quilting the Fat Little Cross block and make it into a pillow cover. Another project I didn't touch. This one goes to the UFO pile possibly never to be seen again. 5. Finish piecing, baste, bind, quilt and label a quilt to trade for a tattoo. I worked on this a tiny bit in the beginning of Q2, but not since. Too much going on for a tattoo, so it's on hold. I think I'll put it on Q3. 6. Finish piecing, baste, bind, quilt and label a Beach Blanket. Another one I didn't even touch. This one I will put on Q3, but I'm not holding my breath. OK. On to the Q3 List: I put six things on this list, like last list. Although that didn't work out well last quarter, I hope to do better! I rolled over three projects this quarter. This one is a wee part of a larger project. Bits and pieces of this project might show up for a while. But for Q3, I just want to finishing the start, if you know what I mean! I have the top of the pillow pieced and basted and I started quilting. Need to finish and build the rest in order to stuff. This is a new goal for Q3. I haven't even touched this quilt since I put it on Q2, so this is pretty ambitious. But I'd be happy to just work on it a little. A more apt goal might just be to get the top done. I do hope to have this one ready for next Summer, tho. This is rolled over from Q2. This is another project that has a Nov giveaway deadline in my mind. But there's a lot of work before we get there. I have quite a bit more fiddly piecing to do, must decide on a final size, and how I want to quilt it. Also ambitious. This goal is rolled over from Q2. This is another new goal. A fresh project that has been my go to work when I'm taking the train (which I had been doing a lot in June). The beginnings came together pretty quickly, so I hope this one moves right along. It also occurred to me who might like this quilt as I typed this, so that might be good motivation!! This one is just an idea and a fabric pull and not due (no pun intended) to be gifted until next year, so I have some time.... But if the mood strikes me, it might happen in Q3. It would also make a really good travel project if #5 gets pieced in a timely manner. It's so fun to see these goals written down each quarter! I have a lot of big projects in the next three months, but I really hope to see some of these quilting goals completed by the start of Q4. And I'm already thinking of Q5 aka Q1 2016!